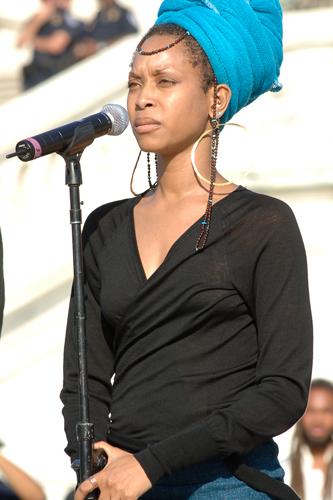 Home Top News	Leave Erykah Badu alone! Erykah Badu, a special artist and free thinker, was hit with the Farrakhan Litmus Test during a recent interview with Vulture.com. First of all the publication has the proper name as vultures feast on dead things. Like the winged scavengers that feed on death, this interview attempted to pick the singer’s bones. Perhaps we should begin with a question: What does a profile by Jewish writer David Marchese about Ms. Badu and her artistic work have to do with the Honorable Minister Louis Farrakhan of the Nation of Islam? Except that Mr. Marchese, once again interjected the 34-year-old fake anti-Semitic canard against the Minister into the discussion. That’s pretty clear. It was also consistent with Ms. Badu’s declaration that she is a humanist, her belief that everyone has some good in them and how she stayed away from speaking for or criticizing others in the interview. She pointed to the art of Nazi Adolph Hitler in an attempt to prove a point and was sandbagged. The interview blew up and Erykah Badu was quickly trending on Twitter—and not in a good way. “People are in real pain. So I understand why my ‘good’ intent was misconstrued as ‘bad’. In trying to express a point, I used 1 of the worst examples possible. Not to support the cruel actions of an unwell, psychopathic Adolf Hitler, but to only exaggerate a show of compassion,” said Ms. Badu via her @fatbellybella Twitter handle. What she faced, in truth, were the problems at the root of this “controversy.” It came fully into the light in 1984 during the Rev. Jesse Jackson’s presidential campaign: Jewish paternalism and control over Black people and Zionist determination to annihilate anyone who dares criticize or even critique U.S. support of Israel or speak to the need for Palestinians to receive justice. FULL REPLAY:: Farrakhan Speaks In North Charleston, S.C.